The Gila Woodpeckers (Melanerpes uropygialis) - also known as Brewster's Woodpeckers or Cardon Woodpeckers - inhabit the desert regions of the southwestern United States and Mexico. They have striking black and white barred patterns on their backs, upper wings and tails. In flight, large white wing patches can be seen. The rest of the plumage is tan-colored. The male can be identified by the small, round, red cap on his crown (top of the head). These active, noisy birds announce their presence by their penetrating calls and the characteristic drumming noises they make while hammering on the trees, cacti, telephone poles and other surfaces, such as metal roofs or drainpipes. Their range extends from southeastern California (Palo Verde Mountains, Imperial County), southern Nevada (along the Colorado River), southern Arizona and extreme southwestern New Mexico (Hidalgo and Grant Counties), and south to parts of Western and Central Mexico. In Mexico, populations are found throughout Baja California (except northwest Baja California Norte), Sonora, southwest Chihuahua, Sinaloa, Durango and Zacatecas. Within their range, they are mostly resident (non-migratory), except for traveling some short distances north or from higher elevations to low elevations in the winter; or local, small-scale movements in response to availability of food. Gila Woodpeckers are typically found in low desert scrub, desert washes, saguaro cactus forests, river groves and cottonwood groves along rivers. They have readily adapted to living in suburbs and towns. Southwestern USA, from southeastern California (Imperial Valley, lower Colorado Valley) and extreme southern Nevada east to extreme southwestern New Mexico; south to western Mexico to Jalisco and Aguascalientes. Range: Southern Baja California (Mexico) - south from the town of San Ignacio. Range: Northwestern Mexico: Southern Sonora and northern Sinaloa; and north central Mexico: southwestern Chihuahua. 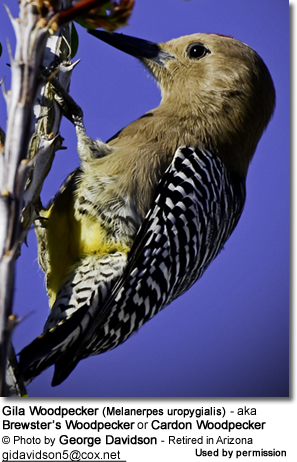 The Gila Woodpecker is a medium- to large-sized woodpecker that measures about 8 - 10 inches (20 - 25 cm) in length. The back and rump is spotted and barred black and white zebra-like patterns. The white wing patches are visible in flight. The darkish tail has white bars on the central tail feathers. The rest of the plumage is mostly greyish-tan in color. The adult male can be identified by the small red cap on the top of his lead (lacking in the female). Juvenile birds look initially like females; as they molt into adult plumage, young males will show isolated red feathers on the top of their head, which eventually fill out until the red crown of the mature adult male is completed. They resemble the Red-bellied Woodpecker; however, in that species both the males and females have extensive red on the head and nape, and the plumage below is paler. 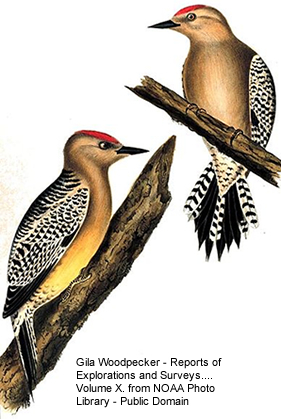 The Golden-fronted Woodpecker has yellow markings on the head; the plumage below is paler and the shows yellow on the head, is paler below and the central flight feathers are dark and unmarked. Gila Woodpeckers are cavity nesters. Depending on the territory they are in, they may nest in the cavities of mature columnar / saguaro cacti, mesquite trees (Honey Mesquite, Screwbean Mesquite), Fremont Cottonwood trees, Goodding’s Willows, Blue Palo Verde trees, and Arizona Sycamores. In urban areas, they may nest in Athel Tamarisk, Eucalyptus and Blue Fan Palm trees. Their nests are typically situated 8 - 32 feet (2.5 - 10 meters) above the ground. A nest may contain 2 - 7 eggs, the average being 3 - 4. Both parents share the incubation of the eggs, which takes about 13 - 14 days to hatching. The hatchlings are helpless and depend on their parents for survival. Both parents feed them; although the male typically spends most of his time guarding the nest and protecting the young, while the female is more involved in gathering food and feeding the young. The young are fed insects, fruits (in particularly the fruit and pollen of the saguaro cacti), and scrap food found in human habitation. The young fledge (leave the nest) when they are about 4 weeks old; but will remain with the parents for some time after gaining independence. Two to three broods may be raised in a season, particularly in the eastern portion of their range, where there are more nesting opportunities due to the summer monsoonal moisture levels. Gila Woodpeckers feed on a variety of insects, small lizards, earthworms, and sometimes the eggs and nestlings of smaller birds, such as Lucy's Warblers, Yellow Warblers and Bell's Vireos. They also eat various fruits (including cactus fruits), berries from shrubs and mistletoe, nectar from flowers, and seeds. 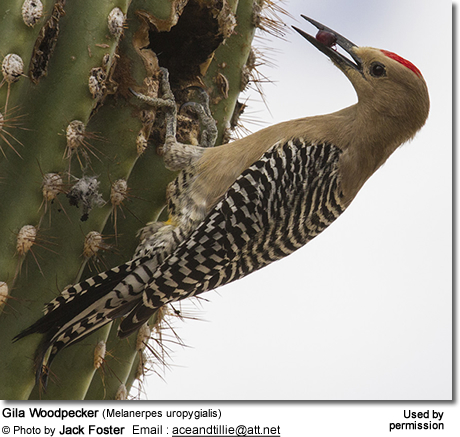 Along with House Finches and White-winged Doves, Gila Woodpeckers are one of the primary dispersers of saguaro seeds. They typically forage on tree trunks and cacti, in outer branches of trees or shrubs - mostly probing or gleaning insects at the surface and occasionally excavating for food. To a lesser extent, they may feed on the ground. In urban areas, they will take advantage of food scraps, as well as visiting bird feeders and sued feeders; and drinking sugar water from hummingbird feeders. Gila Woodpeckers are also known for carrying off dog and cat food, wedging larger pieces into the cracks in tree bark and pecking at it until it's broken up into smaller pieces. Any leftovers are hidden in their territories. Their calls are described as quickly repeated "churr churr churr churr" vocalizations; as well as one call that sounds like rubber ducky. Gila Woodpeckers tap loudly on metal objects as a territorial announcement.